This is the very first What I Wore post. I mentioned I wanted to start inserting a few more style type posts into my blogging (clothes and style is a part of my life after all.. not to mention loving shopping!!) so here is my first attempt at that through an outfit. I have seen this color combo on pinterest before and I knew I had the just right pieces to do the same! I wore this on a chilly drizzly day when I went to the Apricot Lane Boutique opening and on some other errands. 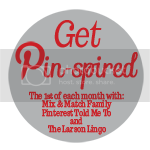 Linking up with Pinterest Told Me To's Get Pin-spired! I love your blue scarf! So cool that you bought it in London, too!